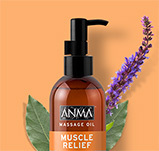 ANMA Massage Oil range is specially formulated with natural oil extracts and are made with 98% naturally derived ingredients. Are ANMA Oils Cruelty free? ANMA Oils hold the Leaping Bunny certification which is the international gold standard for non-animal tested consumer products and remains the most trusted cruelty-free certification for non-animal tested products. Are ANMA Oils Vegan friendly? Where can I buy ANMA Oils? Are ANMA Oils free of Silicones, Parabens, Phosphates and Dyes? ANMA Oils are free from Silicones, Parabens, Phosphates and Gluten.